Hotel Cervia i Rom, Italien: Reservér nu! Deposit paid at the time of the booking is not refundable. The total amount has to be paid within 3 weeks before the arrival. In case of no show the amount of the first night will be charged. A security deposit of 500 euro is needed,by preauthorization of a valid credit card number before the arrival. An additional 15% of the full amount is required at the time of the booking and it is not refundable in case of cancellation, no show or reduction in numbers of persons or of nights. 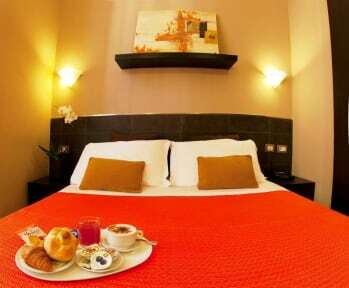 Here you can find clean, comfortable accomodations with discounted rates not easily to be found in the heart of Rome. Owned from the same family since 1957, this one star hotel is located in an ancient building built in 1875 and provides single, doubles and multiple rooms with and without bathroom, recently renewed. Services:24 hour reception, free luggage storage, free wifi area, bar, free baby cot. Big and small groups of schools, associations, universities are welcome. Please ensure that your credit card will be able to cover at least your first night of stay.